Delightful and cheerful, beachfront condo, newly renovated kitchen and bathrooms,in a spacious, three bedroom, two bath condominium on first floor of 16 unit building. Beautiful view of the beach and exquisite sunsets from master bedroom, living room, and balcony. Large balcony overlooks the beach, pool, and hot tub. Direct access to the beach from spiral staircase. King-size bed in master bedroom, two double beds in second bedroom, two twin beds in third bedroom, and pull-out sofa in living room. Maximum occupancy is six plus one small child. NO SMOKING PLEASE. January, February, March and April are monthly rentals only. January, February and March are monthly rentals only. We had a 3 months stay in this wonderful condo. Clean and comfortable and had everything that anybody could want. The owners are so easy to work with and very accommodating! You can’t go wrong renting this unit in this complex! We love Indian Rocks Beach! Thank you for your kind words. We feel the same way about you. You were awesome guests and kept the place immaculately clean. You are welcome to return anytime! Our family loved this delightful condo in every way! Waking up every morning with coffee and fresh French pastries (early morning walks to local Parisian bakery); watching pelicans dive for fish from the front porch; enjoying shell collecting on our daily beach walks; swimming with our grandchildren in the heated pool; relaxing in the hot tub; and feeling completely at home in this light filled spacious 3 bedroom condo with every amenity one could want - extra towels, sheets, beach toys, full array of kitchen dishes and appliances, including washer and dryer. We took our Firestick and enjoyed Amazon Prime and Netflix on evenings when we relaxed at home. Enjoyed fresh grouper at local restaurants, several in walking distance, with our grandkids. Our son in law took his 4 year old fishing under the pier for early morning outings. We felt completely at home in this condo and so appreciative of the extra quality of care the owners have put into making it such a special place. We would love to return next year. We (family of 6) stayed here during the first week of January 2016. The condo had everything we needed/wanted. Being on the 2nd floor afforded us the use of the private staircase down to the pool/spa/beach area...very convenient! The pool and spa were a big hit. It was very handy that the owners have so many beach towels, chairs and other toys. Our kids (early 20s) loved how they could walk to so many bars/restaurants in this very central location. We'll be back! Spacious, clean with tons of extras! We stayed at this condo over Christmas break. It had everything you needed for a home away from home. Fully stocked kitchen, dishwasher, washer/dryer, many tvs with many channels, comfy beds, and easy access to the pool and beach. My family of five LOVED the pool and hot tub - perfect temperatures, and swam at least once a day. You could walk for miles on the beach, perfect for a run, or great for those who want to look for shells, nice sand. Although it was a bit cool for swimming in the Gulf in December, it looks like a great place to be in warmer months. The beach was popular, but not too busy. A short drive to Clearwater Beach or to the Seabird Sanctuary, or into Tampa. We appreciated the condo being allergen-free, as well. Thanks again! All the comforts of home PLUS PLUS! 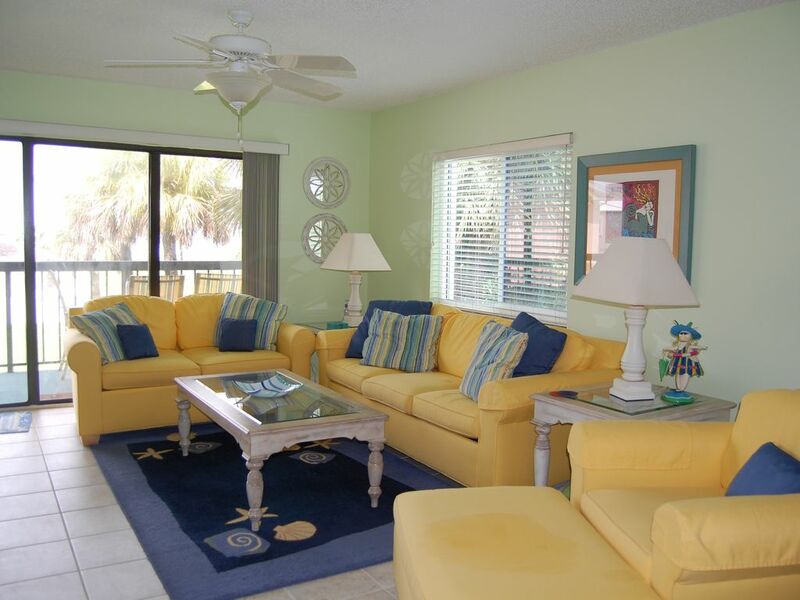 This is a beautifully decorated condo with every item you could need for a week's vacation and then some! We have stayed in dozens of condos, but this is the first one that actually provided a generous supply of towels and sheets, above and beyond what you would expect. The sunset view from the deck is beautiful and there always seems to be a nice breeze blowing through the condo. The beds were comfortable, and there was plenty of furniture for everyone to relax and spread out. The location is fantastic - we walked to a great restaurant every night! The owners are so easy to work with - we would definitely recommend this unit to our friends and family! No refund if guest cancels 60 days before booking.